Mr Ashot Ghulyan, in his capacity of President of the Democratic party of Nagorno Karabakh, attended the annual European Free Alliance General Assembly, which took place in Santiago de Compostela, Spain, on 14 and 15 February 2014. President Ghulyan explained how the right to self-determination was peacefully put into practice in Nagorno Karabakh in line with international law and the applicable framework back in 1991. In addition, he elaborated on how the EU model of development is being implemented in the Republic, especially regarding democratic institutions and human rights, despite the constant external pressure and the absence of EU support of Nagorno Karabakh’s reforms program. Below we provide you with media sources about the event. President of the National Assembly of the Nagorno-Karabakh Republic, President of the Artsakh Democratic Party Ashot Ghulyan on Friday took part in the 12th General Assembly of the European Free Alliance (EFA). The President of the Artsakh parliament had arrived a day earlier in Santiago de Compostela of Spain at the invitation of the political leadership of the EFA. 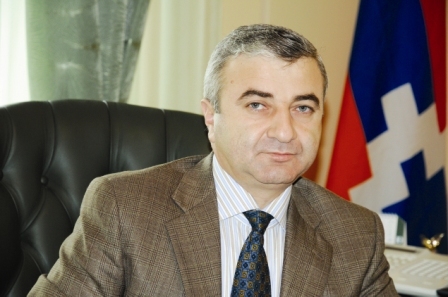 During the plenary sessions dedicated to fundamental rights and freedoms, Ashot Ghulyan presented the path of implementation of the right of self-determination of the people of Artsakh, underlining that the Referendum on Independence conducted on December 10, 1991 was held in full compliance with the then acting legislation and the norms of the international law and could be considered the first success story in the European area. The meetings of Ashot Ghulyan with the leadership (Bureau) of the European Free Alliance and a number of leaders of the EFA member parties will take place on the sidelines of the congress. The European Free Alliance is a European political organization gathering different European parties striving for sovereignty or self-government for their respective region or country. The Alliance is a strong supporter of the right of self-determination and advocates the right of people to decide their own future. The right to self-determination is the key element in the EFA’s program and ideology. The European Free Alliance has around 40 national and regional member parties from over 17 countries of the EU, that represent stateless people, the national minorities and regions of Europe. Among those countries are Austria, Belgium, Great Britain, Germany, Greece, Spain, France, etc. The AFA is represented in the European Parliament by 7 MPs who are members of the fourth largest faction in the European Parliament – the Greens.